A Spicy group of diners at Le Spice! Helene, Gill, (Darling Wine Bar), and Julie, (Sira Boutique Hotel), with Marco, enjoying a great girls’night out at Chez Marco. About to enjoy the Bennett Lerner concert were Jonathan, Beryl, Jern and Roger. 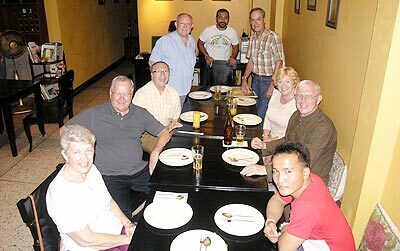 Enjoying ‘Rainbow Night’ at the Moxie were Bernard, Tri, Howard, John, Lance and Ong (standing), John, Pop and Ian (seated). 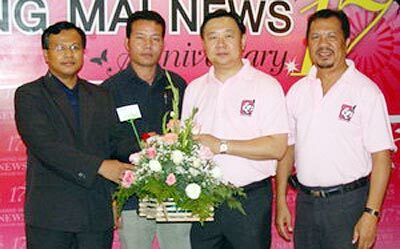 to Sarawuth Saetieo, (2nd right), director of the Chiang Mai News, at the newspaper’s 17th anniversary celebrations held at the Lotus Pang Suan Kaew Hotel on June 14. 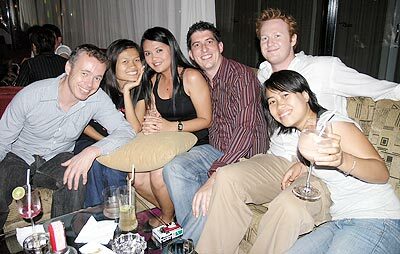 Pictured on the right is Santad Saksoong, editor of the Chiang Mai News. Enjoying some great 70’s music on ‘Disco Night’ at the Glass Onion were Gary, Tukta, Nity, Clive, Zane and Woon (l/r). 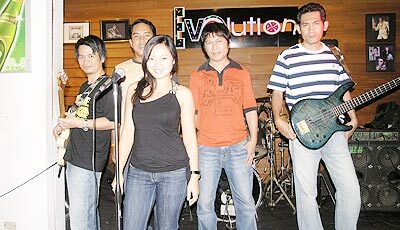 “Evolution”, band for the night at the Imperial Mae Ping’s beer garden, playing some great music.